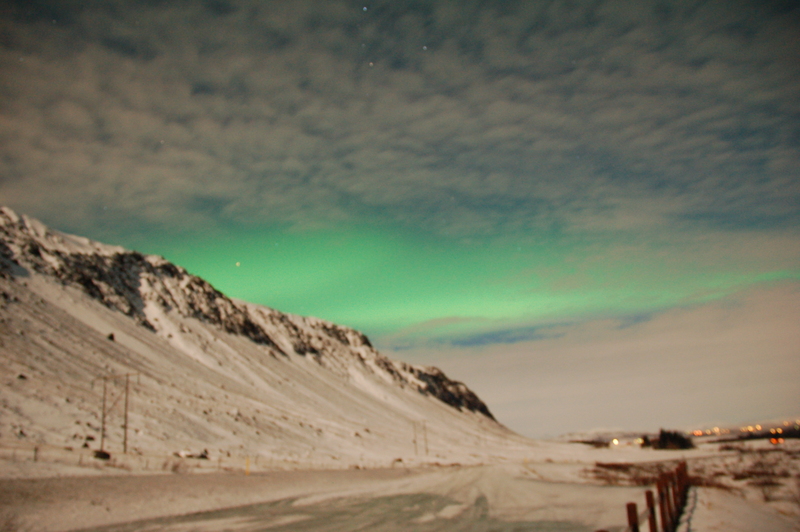 The Northern Lights tour is one of the trickier tours. It revolves around Aurora Borealis, an unpredictable natural phenomenon that paints the sky with green and purple colors. For this tour to be successful you need clear skies and a lot of solar activity, to say the least. Gateway to Iceland pays close attention to these aspects whenever they have a Northern Lights tour scheduled (NOTE: every day between October and April). 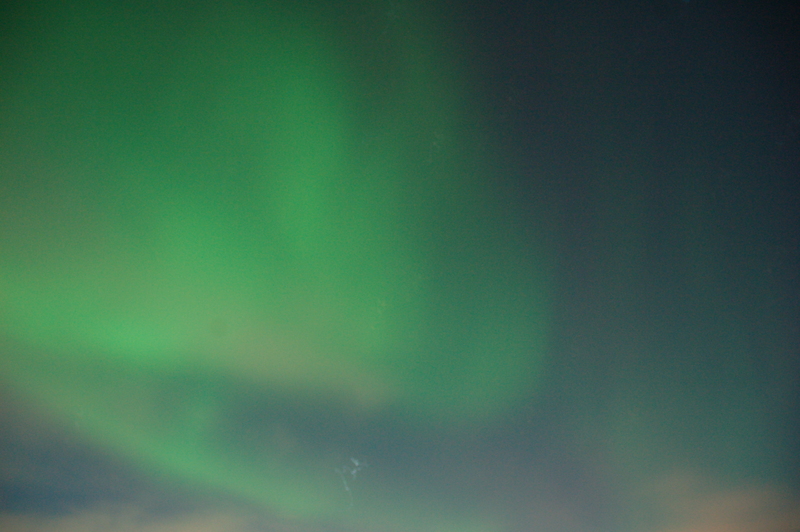 If the conditions do not promise Northern Light visibility, the tour is canceled. This means that when the tour does go out, there is an increased chance of seeing the Lights but, still, there is no guarantee. The solar activity is supposed to be highly active this week and when the latest update for the weather forecast predicted clear skies, I decided to join the Northern Lights tour for Monday night. 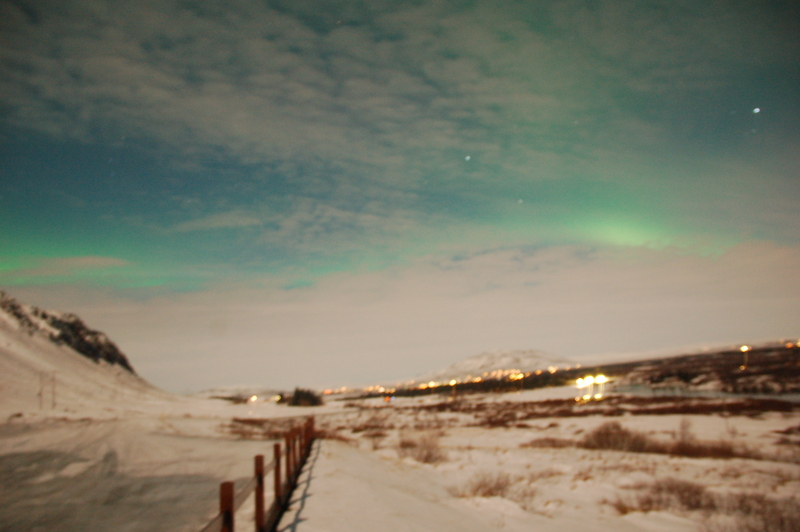 I had already been on the Northern Lights tour on my very first night in Iceland. However, due to exhaustion from traveling that day, I couldn’t help but sleep through half of it. Because I want to give a completely accurate description of the tours, I decided not to write a blog post about that tour, even though the moments I was awake during it were very enjoyable. I would be joining Gummi’s group for tonight, as he picks me up just after 21:30, as the last person in the minibus. While driving away from the light pollution of Reykjavik we paid close attention to the sky and all we could see – were clouds. The first stop we made was at a side road, where no street lights could be found. Everyone got off the bus and started looking up at the sky – still only clouds. We weren’t there for too long when Gummi started shouting enthusiastically that we should get back on the bus because he had just received a phone call from someone telling him that the skies in the south were completely clear. While we were driving away Gummi told us what exactly are we looking for – sometimes, when the lights aren’t bright enough, they can look like a thin white cloud, but you can still see its colors when you take a picture of it. Gummi also gave instructions on how to set the settings on our cameras if we wanted to take photos. He also told us that we could always ask him for help. When we reached the point where the skies became clearer, we started scanning the sky for something that might be the famous Northern Lights. Often, Gummi would park the car and just take a picture of what could be the Lights, to see if they were clear on the camera. After a while, Gummi told us to get out of the bus and pointed towards a very faint white arch. It was very cold outside and when everyone had seen enough we went back on the bus to stay warm. At that point, I started wondering, “What if we don’t see them tonight? What if all we have to settle with is these faint lights?”. While these thoughts crossed my mind, Gummi looked to his side, through the window, and said: “The lights are becoming brighter, they’re illuminating!”. So I opened the car door, assured the others could get off the bus as well and walked to the other side of the coach. And there it was. A beautiful green arch right above us! It was a beautiful display already on its own, but then the Lights started to dance! I had heard people saying: ”We saw the lights dancing above us” and always thought it was just an expression. Not anymore as there they were, literally moving through the sky. To top it all off, I managed to take pictures of the spectacle! Alright, I took them with Gummi’s camera, and Gummi had done all the settings, but I pressed the button to take the pictures, and that’s important too! 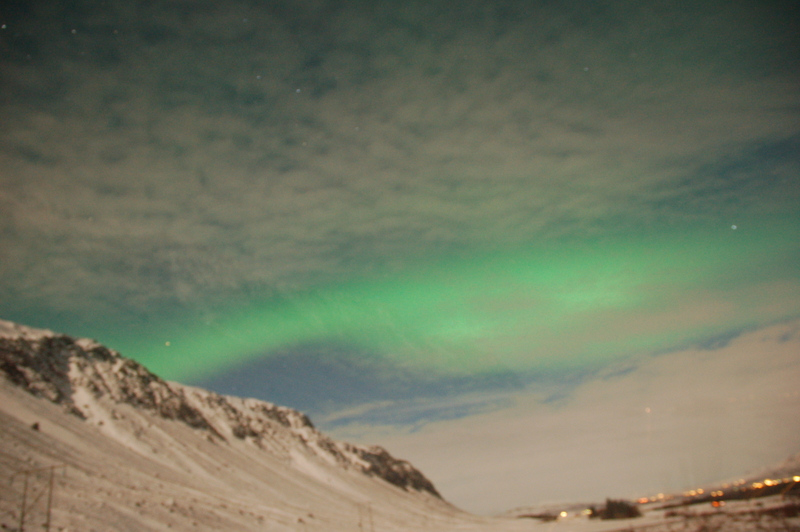 The sky did not stay completely clear, yet we could still see these amazing lights despite the clouds. We had as much time as we wanted to look at the Lights. It wasn’t until I felt like my feet had turned into ice cubes, that the lights faded and I could get myself back on the coach, along with a few others who couldn’t get enough of the Lights. After driving only for a short while, Gummi looked outside again and said: ”They’re back!”. So he parked by the side of the road again, for the last look. When these lights faded, we headed back to Reykjavik, still scanning the sky constantly to see if we had one more chance to see them. However, our luck had run out. We returned to the city tired, yet completely satisfied, because seeing the Northern Lights is definitely worth losing a bit of sleep over.